An airborne wind turbine is a design concept for a wind turbine with a rotor supported in the air without a tower, thus benefiting from more mechanical and aerodynamic options, the higher velocity and persistence of wind at high altitudes, while avoiding the expense of tower construction, or the need for slip rings or yaw mechanism. An electrical generator may be on the ground or airborne. Challenges include safely suspending and maintaining turbines hundreds of meters off the ground in high winds and storms, transferring the harvested and/or generated power back to earth, and interference with aviation. Airborne wind turbines may operate in low or high altitudes; they are part of a wider class of Airborne Wind Energy Systems (AWES) addressed by high-altitude wind power and crosswind kite power. When the generator is on the ground, then the tethered aircraft need not carry the generator mass or have a conductive tether. When the generator is aloft, then a conductive tether would be used to transmit energy to the ground or used aloft or beamed to receivers using microwave or laser. Kites and helicopters come down when there is insufficient wind; kytoons and blimps may resolve the matter with other disadvantages. Also, bad weather such as lightning or thunderstorms, could temporarily suspend use of the machines, probably requiring them to be brought back down to the ground and covered. Some schemes require a long power cable and, if the turbine is high enough, a prohibited airspace zone. As of July 2015, no commercial airborne wind turbines are in regular operation. An aerodynamic airborne wind power system relies on the wind for support. Miles L. Loyd proposed and analyzed an efficient AWES in his work "Crosswind Kite Power" in 1980. Power output of AWES with crosswind wing motion is proportional to a square of a lift/drag ratio of the wing. Such AWES is based on the same aerodynamic principles as a conventional wind turbine (AWES), but it is more efficient because the air speed is constant along the wing span and the aerodynamic forces are resisted by tension of a tether, rather than by bending of a tower. 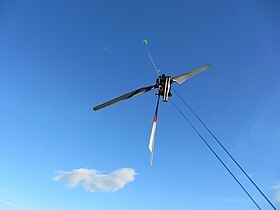 Bryan Roberts, a professor of engineering at the University of Technology, in Sydney, Australia, has proposed a helicopter-like craft which flies to 15,000 feet (4,600 m) altitude and stays there, held aloft by wings that generate lift from the wind, and held in place by a cable to a ground anchor. According to its designers, while some of the energy in the wind would be 'lost' on lift, the constant and potent winds would allow it to generate constant electricity. Since the winds usually blow horizontally, the turbines would be at an angle from the horizontal, catching winds while still generating lift. Deployment could be done by feeding electricity to the turbines, which would turn them into electric motors, lifting the structure into the sky. The Dutch ex-astronaut and physicist Wubbo Ockels, working with the Delft University of Technology in the Netherlands, has designed and demonstrated an airborne wind turbine he called a "Laddermill". It consists of an endless loop of kites. The kites lift up one end of the endless loop (the "ladder"), and the released energy is used to drive an electric generator. A September 2009 paper from Carbon Tracking Ltd., Ireland has shown the capacity factor of a kite using ground-based generation to be 52.2%, which is better than terrestrial wind-farm capacity factors of 30%. A team from Worcester Polytechnic Institute in the United States has developed a smaller-scale with an estimated output of about 1 kW. It uses a kiteboarding kite to induce a rocking motion in a pivoting beam. The Rotokite is developed from Gianni Vergnano's idea. It uses aerodynamic profiles similar to kites that have been rotated on their own axis, emulating the performance of a propeller. The use of the rotation principle simplifies the problem of checking the flight of the kites and eliminates the difficulties due to the lengths of cables, enabling the production of wind energy at low cost. The Heli Wind Power is a project of Gianni Vergnano that uses a tethered kite. The HAWE System  is developed from Tiago Pardal's idea. The System that consists in a Pumping Cycle similar to kite systems. In Generation Phase the pulling force increase 5-10 times due to Magnus Effect of a spinning cylinder(aerial platform), like a kite the pulling force produced by the aerial platform will unwind the cable and generate electricity in the ground.In the Recovery Phase it rewinds the cable with no Magnus Effect in the aerial platform. In August 2011 the German company SkySails, producer of kites for ship propulsion, announced a kite-based wind power system for on- and offshore applications that is supposed to be "30% cheaper than current offshore solutions". In June 2012, the German company NTS GmbH had successfully tested X-Wind technology (spoken: Cross-Wind) on linear rail system in Freidland, Germany. "NTS Energie- und Transportsysteme GmbH" was found in 2006 by Uwe Ahrens. X-Wind technology combines two well-known technologies - automatically steered kites and generators on a closed loop rail system. Closed loop prototype is under construction at Mecklenburg-Vorpommern, Germany. This technology allows to harness increasingly stable and constant wind currents at altitudes between 200 and 500m. Technical report readings and measurements show that NTS X-Wind Systems double to triple the efficiency of conventional wind energy systems according to energy production. In May 2013, the Californian company Makani Power, developer of some crosswind hybrid kite systems with onboard generator doubling as motor, has been acquired by Google. In May 2013, an airborne wind energy system with a ground-based generator using fast motion transfer was suggested by L. Goldstein. In 2015, a sails on rope wind and ocean current energy system was invented by a Taiwanese Johnson Hsu. On 15 December 2015 Windswept and Interesting Ltd demonstrated a "Daisy" kite ring stack airborne wind turbine. The Daisy kite stack demonstrated on 15 December 2015 is the only airborne wind energy system to have won the someawe.org 100*3 AWE challenge. The Daisy system uses tensioned torsion transfer of kite motion to turn a ground based generator. Kitemill flies an airplane tethered to a winch powering a 5 kW generator on ground. Since 2014, Kitewinder, a French company located near Bordeaux is working on the first commercial airborne wind turbine named Kiwee One. Kiwee one is a back pack airborne wind turbine for nomadic uses with a nominal power of 100 Watts. Kiwee one launch procedure is manual but the product is equipped with an automatic retrieval mechanism for low wind / high wind conditions. An aerostat-type wind power system relies at least in part on buoyancy to support the wind-collecting elements. Aerostats vary in their designs and resulting lift-to-drag ratio; the kiting effect of higher lift-over-drag shapes for the aerostat can effectively keep an airborne turbine aloft; a variety of such kiting balloons were made famous in the kytoon by Domina Jalbert. Balloons can be incorporated to keep systems up without wind, but balloons leak slowly and have to be resupplied with lifting gas, possibly patched as well. Very large, sun-heated balloons may solve the helium or hydrogen leakage problems. An Ontario based company called Magenn is developing a turbine called the Magenn Air Rotor System (MARS). A future 1,000-foot (300 m)-wide MARS system would use a horizontal rotor in a helium suspended apparatus which is tethered to a transformer on the ground. Magenn claims that their technology provides high torque, low starting speeds, and superior overall efficiency thanks to its ability to deploy higher in comparison to non-aerial solutions. The first prototypes were built by TCOM[who?] in April 2008. No production units have been delivered. Boston-based Altaeros Energies uses a helium-filled balloon shroud to lift a wind turbine into the air, transferring the resultant power down to a base station through the same cables used to control the shroud. A 35-foot prototype using a standard Skystream 2.5kW 3.7m wind turbine was flown and tested in 2012. In fall 2013, Altaeros was at work on its first commercial-scale demonstration in Alaska. ^ Elliot, Dave (2014-04-12). "Flights of fancy: airborne wind turbines". Institute of Physics, Environmental Research Web. ^ Levitan, David (2012-09-24). "High-Altitude Wind Energy: Huge Potential — And Hurdles". Environment 360. How do you safely suspend airborne turbines hundreds or thousands of feet off the ground? How do you keep them aloft for long periods of time in high winds without having to perform frequent, costly maintenance? And what about interference with aviation? ^ "Airborne Wind Energy Generation Systems". www.energykitesystems.net. ^ Jha, Alok (3 August 2008). "Giant kites to tap power of the high wind". The Guardian. ^ O'Gairbhith, Colm (2009-09-11). "Assessing the Viability of High Altitude Wind Resources in Ireland" (PDF). Retrieved 2009-09-11. ^ "SkySails GmbH - Compelling Technology". www.skysails.info. Archived from the original on 2011-09-28. Retrieved 2011-10-22. ^ "Inside Google's Secret Lab". 28 May 2013. Retrieved 3 April 2018 – via www.bloomberg.com. ^ Goldstein, Leo (2013). "Theoretical analysis of an airborne wind energy conversion system with a ground generator and fast motion transfer". Energy. 55: 987–995. doi:10.1016/j.energy.2013.03.087. ^ "Main - Windswept and Interesting". www.windswept-and-interesting.co.uk. ^ "AWE Challenge - someAWE". www.someawe.org. ^ "77 folkeinvestorer skal holde det svevende, norske kraftverket i himmelen hele døgnet, hele året". Teknisk Ukeblad. 11 January 2017. Retrieved 11 January 2017. ^ ""Magenn Air Rotor System" (broken link)". ^ Kumar, Moses Dhilip (18 July 2013). "Technical World : MAGENN AIR ROTOR SYSTEM (M.A.R.S.)". ^ "Magenn Power Inc. corporate website". Archived from the original on 11 December 2008. Retrieved December 14, 2008. ^ Mazzella, Diana (2008-04-03). "Airborne turbine tested at TCOM; Magenn: MARS makes wind power mobile". The Daily Advance. Retrieved 2008-11-23. ^ Boyer, Mark. "Altaeros Energies’ Floating Wind Turbines Tap Into Strong High Altitude Winds" Inhabitat, 28 March 2012. Retrieved: 9 July 2012. ^ Slice of MIT. "Two Alums Dream of Tethered Aerostat Wind Farms." http://alum.mit.edu/pages/sliceofmit/2013/09/04/two-alums-dreaming-of-tethered-aerostat-wind-farms/ Retrieved 2013-09-05. ^ Diane Cardwell. "Wind Industry’s New Technologies Are Helping It Compete on Price". New York Times. 2014.